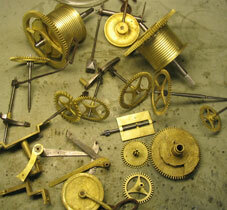 Jewelwork workshops are equipped with modern up-to-date tools, laithes and machinery. We use traditional skills and workmanship acquired over three generations. We always have a large selection of material in stock – obsolete parts can be manufactured in our workshop. 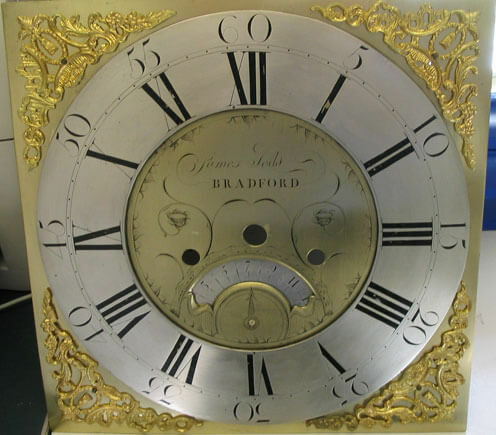 Long Case restoration including dial refurbishment. 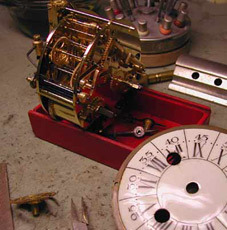 Original clock as it came into Jewelwork. You can clearly see corrosion on both the chapter ring and brass spandrels. 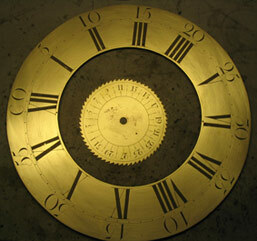 The dial will need to be completely disassembled, blocked down, polished, re-silvered and then lacquered. Movement as it arrived at Jewelwork, complete with cobwebs, spiders, dust etc... 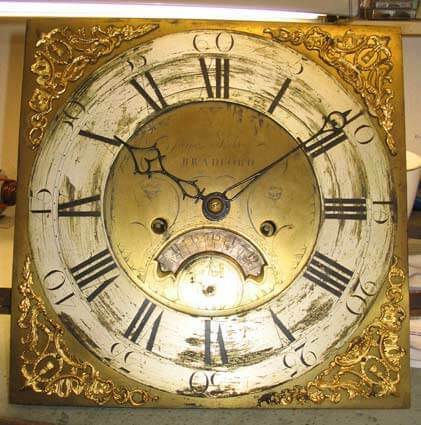 This poor clock has seen much better days and requires a great deal of work in order to restore it to good going condition. 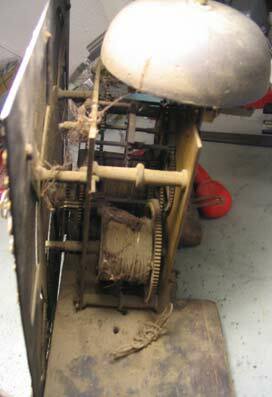 Dial has been stripped down and fully blocked off to remove corrosion and reduce deep pitting. This is then hand polished and buffed. 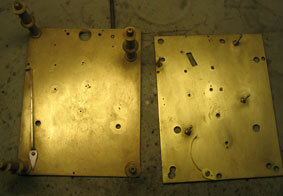 Note how this removes the silvered surfaces to reveal the bare brass. 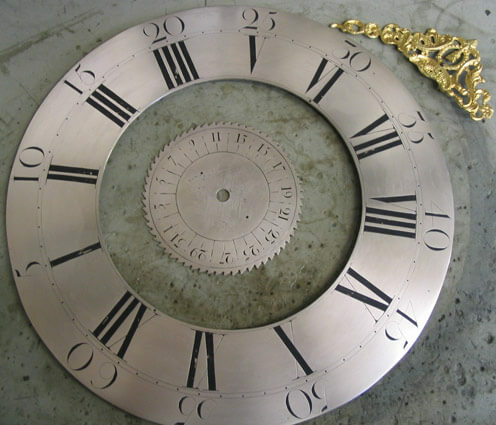 The chapter ring, calendar wheel, spandrels and plate are now lacquered and put back together. This now completes the dial work. Next, the clock plates and wheels need to go through the ultrasonic cleaners and repairs to both the going and striking sides need to be made. 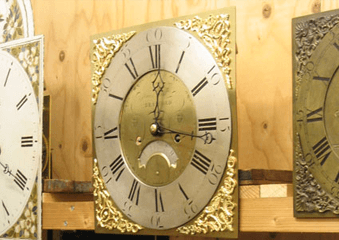 These repairs will include turning and fitting new bushons, hand burnishing all pivots, re-topping the escape wheel, re-manufacturing click and springs, re-facing pallets, correcting crutch piece and correcting wear within the clock trains. Below you can see the wheels being put into place and aligned correctly. Once the top plate has been pinned on, the lifting work can then be set up on the clock. 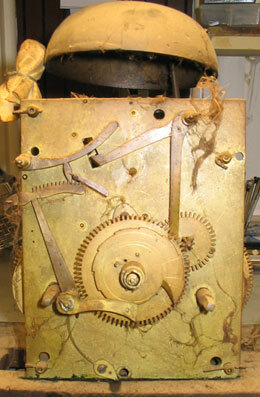 The clock will then be oiled/greased and refitted to the base board. 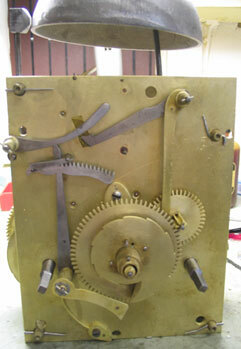 The lines, dial and hands can then be fitted. The clock is finally complete and awaiting dial installation. 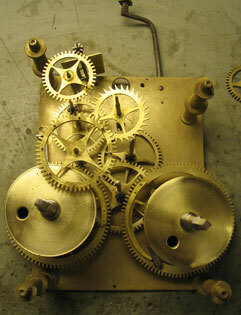 The clock is finally complete and on a test rig, where it is thoroughly checked out for correct operation and timing. This process will last for 2 - 3 weeks. 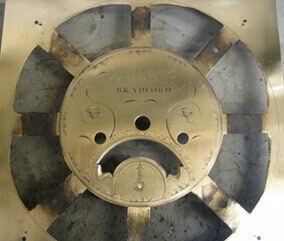 The escapement is the 'heart' of your mechanical watch. The tick you hear is made by this constantly beating heart. Over 400,000 times a day the jewels on the lever strike the teeth of the escape wheel, measuring exactly one fifth of a second each time. The balance wheel controls this accuracy. This tiny wheel (approx. 5mm in diameter) is made of very special alloys, designed to overcome temperature variances and positional errors. The balance wheel makes 216,000 complete oscillations a day, the outside of the balance wheel travelling a distance of 3 miles a day - that's over 1,000 miles a year, without stopping. The hairspring and balance wheel work together. These are two of the finest parts of your watch. It coils and uncoils nearly half a million times a day, controlling the balance wheel. The jewels in your watch are surface hard and finely finished to allow metal pivots to turn with the minimum of friction. Raw jewels alone cost little - it is their precise finish and perfect positioning that gives your watch accuracy and reliability. Remember, your watch works 24 hours a day throughout the year. It needs regular servicing approximately every 18 to 24 months by a highly skilled technician, to ensure continued reliability. Jewelwork can look after all your needs. Please visit our shop at 26 MONTAGUE STREET, WORTHING, W. SUSSEX. where we will be pleased to offer you our help and expertise on repairs, valuations, insurance claims, part-exchanges, etc. Monday – Saturday 9.15am to 5.00pm. Copyright © 2019 Jewelwork. All rights reserved.